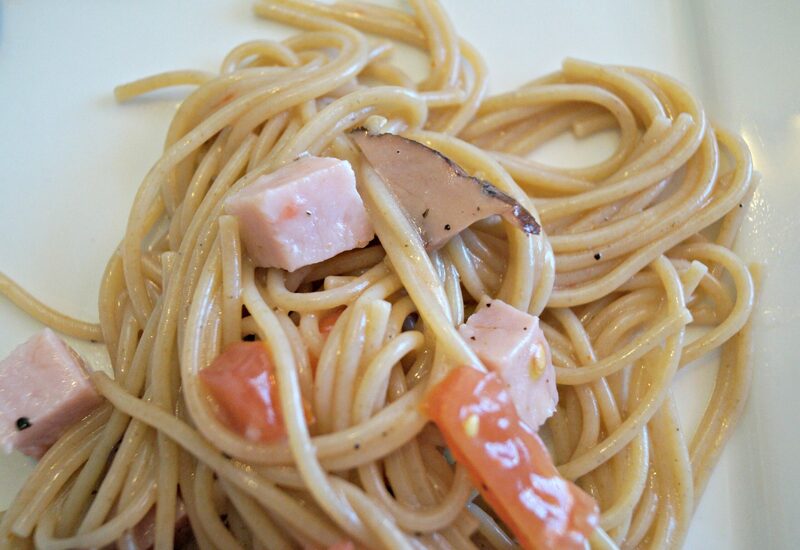 This easy real food dinner recipe is one of our family’s favorite meals. My husband introduced this recipe to me when we made the decision to start eating more real food. We decided together that no matter what we cooked at home, it had to be better than eating fast food. Bad eating habits can be hard to change so we decided that eating at home would be the first step. My husband was very excited to jump into helping out in the kitchen and make this recipe for us. His father had made this recipe for him as a child and it was always one of his favorites. 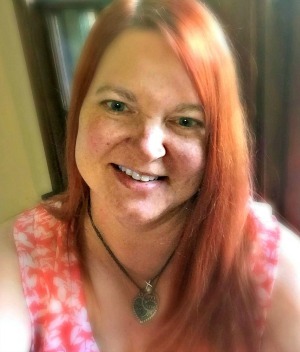 Super easy to make……. and with ham and pasta as ingredients it sure is child-friendly. The technique is easy. Chop some fresh ingredients, boil some pasta, and toss together. This meal tastes delicious hot and equally good (if not better) the next day cold. 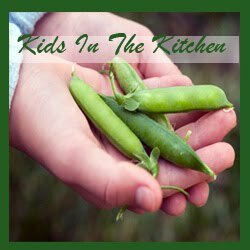 My kids fight over the leftovers for their lunch the next day so I recommend you make a big batch for your family. Add whole wheat pasta and cook until done. Usually about 9 minutes. Chop up tomatoes and ham into bite-sized pieces. 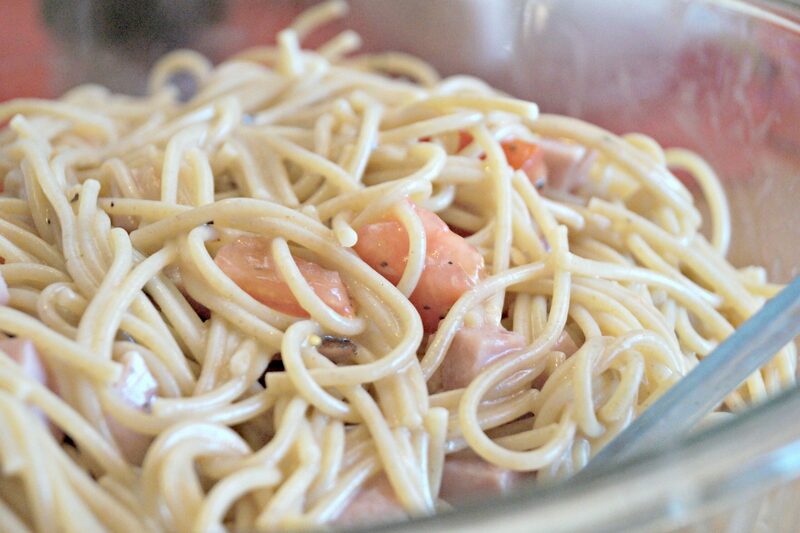 In a large bowl combine pasta, tomatoes, ham, and Italian dressing. Stir to mix dressing evenly. Be careful not to stir too hard. You don't want to break up the tomatoes. Enjoy hot or refrigerate to enjoy cold. We recommend you use organic ingredients where available. How often do you eat at home each week? Do you think the quality of food is better when you cook at home? Do you find that your schedule decides whether or not you eat at home?? 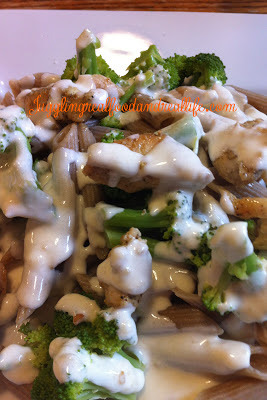 You might also be interested in this pasta with Alfredo Sauce recipe. You can’t go wrong with 15 minutes!! Thanks for all your great ideas Christina…this looks delicious! 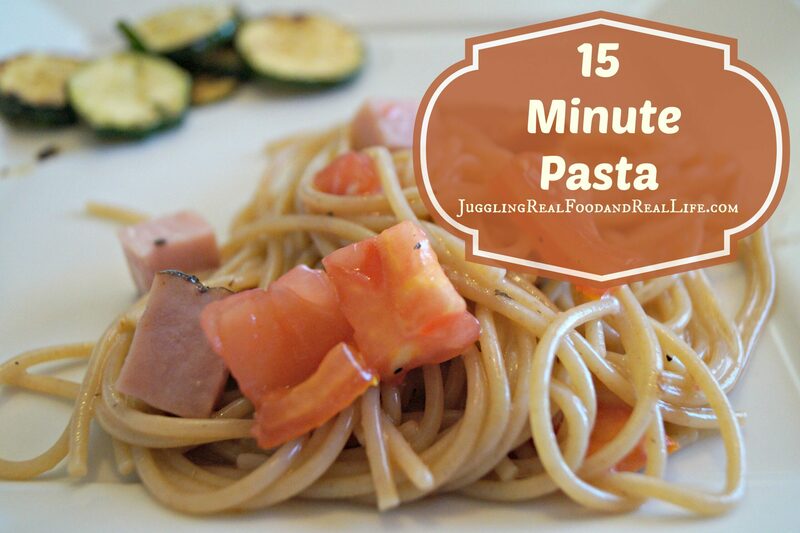 If every meal only took 15 minutes! Can you imagine all of the time we would have to do other things Janelle? Ahh………a girl can dream. Good Friday Morning from Tampa! I only recently had pasta with just butter salt, pepper and parmesan, I grew up always having a heavy sauce of some sort on pasta. My tummy was upset, my hubby made the butter pasta and it was great. i would never have thought about Italian Dressing. Definately trying this, Thanks. I can relate to your story. I grew up eating only red sauce on pasta. This recipe was a delicious twist for me as well. It’s good to expand our culinary worlds. I love discovering all sorts of new flavors. Thanks for stopping in! Wow Christina! Only 15 minutes. You’re a life saver! The meal was super tasty and so easy to make. I just added some pineapple pieces because I always love the combination of ham and pineapple.